It’s June, and that means there are only two teams left standing in the NBA. 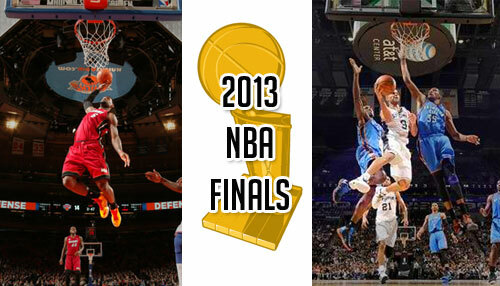 We should be in for a great series as the San Antonio Spurs and the Miami Heat face off in the 2013 NBA Finals. The best of the best, they say. Anyway, here’s our take on this series right before it kicks off. The two matches the Spurs and Heat played in the regular season were bizarre. The Heat swept the season series, two games to none, but we’re pretty sure we won’t see the same thing in the Finals. In the first matchup, Spurs head coach Gregg Popovich rested his Big Three and Kawhi Leonard. LeBron James and Dwyane Wade sat for the Heat in the second game. You could say this favors the Heat because they won even without the two stars, but you should throw that out of the window now because it’s the Finals. The Spurs are headlined by Tony Parker, Tim Duncan, and Manu Ginobili, while the Heat have their highly touted Big 3 of James, Wade, and Chris Bosh. It might be easy to think that the Miami Big 3 has the edge, with the relative youth and athleticism, especially considering Parker is still hampered by an injury. Wade, though, has ailments of his own to manage, and Bosh has been playing like crap for most of these Playoffs. Leonard will definitely match up against LeBron, and it will be interesting to see how the second-year man out of San Diego State (who turns 22 on June 29) will handle arguably the most athletic basketball player in the world. That’s why all eyes will be on him, and it’s not just because he’s in the same frame as James. He has the potential to be the Spurs future cornerstone, and this matchup will help mold him. Depth will definitely play a big part in these Finals. With Ray Allen and the likes of Norris Cole and Mike Miller coming off the bench for Miami, they have enough firepower outside the Big 3 and other starters. The Spurs are not short on offensive sparks, though, with a bunch of pretty good outside bombers like Matt Bonner and Gary Neal. The problem for San Antonio is the fact that this is the first time in the Finals for many of its role players. You can’t predict how they will react to the bright lights in the biggest stage of them all. Pop will do everything that he can to make sure his boys are prepared, but we won’t know how well they can handle the pressure until the ball goes up and the series begins. If Miami can stick to the small-ball game that it has succeeded with for the majority of this season, they will have no problem outplaying the Spurs in transition. Teams have a hard time stopping the Miami fastbreak machine, and if the Heat can scramble on defense the way we’ve seen, they’ll be able to force some turnovers on this Spurs team and initiate its running game. Another key for the Heat is Wade. It took him 11 games before he reached the 20-point mark in Game 7 against the Pacers. It’s the Finals now, and he can’t expect LeBron to bail him out each time. There’s a lot to be said about him stepping up in the coming games. Of course, LeBron continuing to play the way he has is a big key for the Heat. It all starts and ends with LeBron James, and if he keeps being aggressive and doesn’t settle for fadeaways, he can make plays for his team from practically anywhere on the floor. The Spurs play the kind of team game any basketball fan loves to watch. Expect more of the same from Coach Pops’ boys. San Antonio plays unselfish basketball, and they move the ball very efficiently to hit open shooters. Miami has had difficulty dealing with three-point shooting teams because the Heat can’t load up on the penetration and the interior, and if the Spurs can shoot it well this series, Miami will have a tough time on D.
Duncan might see a variety of matchups, not the least of which are Bosh, Chris “Birdman” Andersen, and Udonis Haslem. While we have no doubt Timmy can match up well against either big man, being able to dominate them will really help the Spurs this series. The same way Miami was forced to go out of its comfort zone matching up against the Indiana Pacers’ bigs, having a dominant Duncan will be a boon for the Spurs. He might not be paired up with another dominant big, but being a presence down low will put tremendous pressure on the Heat defense. Last but not least, a healthy Tony Parker will be the biggest key. He’s the leader now, and where he goes, the others follow. He’s a superb penetrator, and he is as good as any at breaking down a defense to get an easy layup or hit the open three-point shooter. In the past decade, the Spurs have won the title every time they reached the Finals. They are arguably the smartest team the Heat will face since the 2011 Dallas Mavericks (honorable mention to this year’s Pacers). The Heat are seeking back-to-back championships and have been the East’s representative to the big dance for three years running. They still have the best player in the world today, and they have surrounded him with as much help as he needs. Considering everything, we think the Miami Heat will win this series in six games and win their second straight title. Thanks! Nice work, too, and very comprehensive. Anyway, I think Danny Green, Kawhi Leonard and the rest of the Spurs’ role players proved us wrong in Game 1 last night. They executed as well as they have in these playoffs and made Miami work hard for everything. Seems like Pop really prepared his team well, which isn’t really surprising at all.